Tin oxide catalysts, pure and surface-modified with different loading levels of copper, have been prepared and characterized by means of thermal analysis (TGA and DTA), X-ray powder diffraction (XRD), nitrogen adsorption at -196 ºC, FT-IR spectroscopy using KBr pellets and potentiometric titration using n-butylamine. Structural investigation of the catalysts by TGA, XRD and N2-sorption revealed that tin gel has at least two molecules of water to give the formula SnO2.2H2O and the addition of Cu does not modify the crystalline structure of tin oxide (tetragonal phase) but slightly change the specific surface area and the degree of crystallization. Acidity measurement by potentiometric titration using n-butylamine shows that the addition of Cu can increase the acidity of tin oxide and all Cu modified tin oxide having weak and strong acid sites. 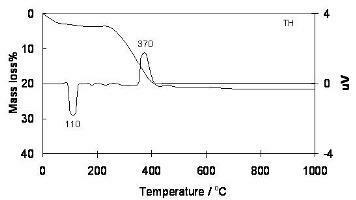 Moreover, FT-IR spectra expose that, for Cu modified tin oxide, there is no new compound formed between SnO2 and CuO.